Provide a user manual describing the submission of AIRR data using the NCBI reference implementation described in [Rubelt_2017]. This implementation uses NCBI’s BioProject, BioSample, Sequence Read Archive (SRA) and GenBank repositories and metadata standards to report AIRR data. To facilitate AIRR data submissions to NCBI repositories, we have developed the NCBI-compliant metadata submission templates both for single and bulk AIRR data submissions. 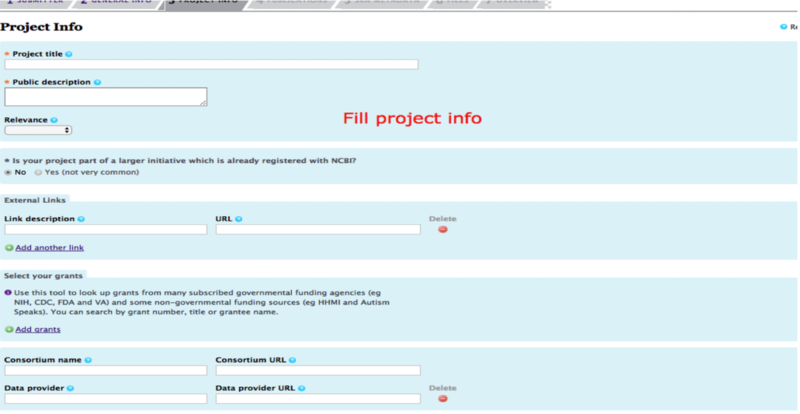 NCBI provides a web-based interface to create a BioProject and allows to BioSample, Sequence Read Archive (SRA) and GenBank metadata via tab-delimited files for single BioProject related data files submission. To support the bulk submission of metadata through the FTP, NCBI also has established an XML schema. This will promote the standard and provide important feedback for its iterative improvement. Since we propose to include a combination of raw and processed sequence data, the AIRR standard will sometimes need to be distributed and linked across multiple repositories (e.g., data in SRA linked to related data in GenBank). In addition, the data elements that comprise the standard will be mapped to ontologies in BioPortal through NIH CDE (Common Data Element) terms. These linkages will support more sophisticated validation and logical inference. Go to https://submit.ncbi.nlm.nih.gov/subs/sra/ and login with your NCBI account (create an account if necessary). Click on “create new submission”. You will see a form as below. Fill the form with required information and click on “continue”. If you are submitting for the first time, check “Yes” on the “new BioProject” or “new BioSample” options to create a new project or sample, respectively. Fill in the project information. Add as much relevant information you can add in description. It will help later in searching the particular submission. 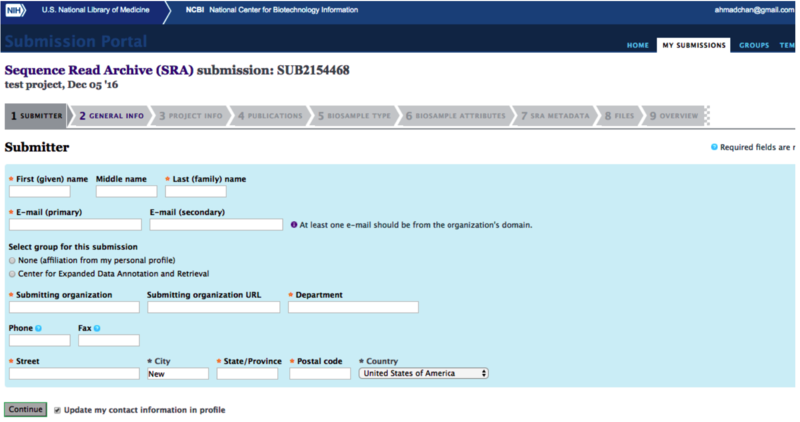 The AIRR BioSample template is not yet listed on the NCBI website. The template sheet AIRR_BioSample_V1.0.xls can be downloaded from https://github.com/airr-community/airr-standards/tree/master/NCBI_implementation/templates_XLS. Fill in the required field and save the file as tab-delimited text file (.TSV format), then upload it. To submit the SRA metadata use the AIRR_SRA_v1.0.xls file. Make sure that the column sample_name uses sample names that match the record in the BioSample template (if new BioSamples are being submitted) or a previously entered record. Also this file must be saved as tab-delimited text file for upload. Submit the raw sequence file. In addition to the web interface, NCBI provides an FTP-based solution to submit bulk metadata. The corresponding AIRR XML templates can be found under https://github.com/airr-community/airr-standards/tree/master/NCBI_implementation/templates_XLS. Otherwise users should refer to the current SRA file upload manual https://www.ncbi.nlm.nih.gov/sra/docs/submitfiles/. Users planning to frequently submit AIRR-seq data to SRA using scripts to generate the XML files MUST ensure that the templates are identical to the current upstream version on Github. Processed sequence data will be submitted to the “Targeted Locus Study” (TLS) section of GenBank. The details of this submission process are currently still being finalized. Basically the procedure is identical to a conventional GenBank submission with the exception of additional keywords marking it as TLS submission. Non-productive records should be removed before the data submission or use an alternative annotation as described in the specification document. Sequin, NCBI’s stand-alone submission tool with wizards to guide the submission process is available by FTP for use on for Windows, macOS and Unix platforms. Tbl2asn is the recommended tool for the bulk data submission. It is a command-line program that automates the creation of sequence records files (.sqn) for submission to GenBank, driven by multiple tabular unput data files. Documentation and download options can be found under https://www.ncbi.nlm.nih.gov/genbank/tbl2asn2/.